Who woulda thunk it? 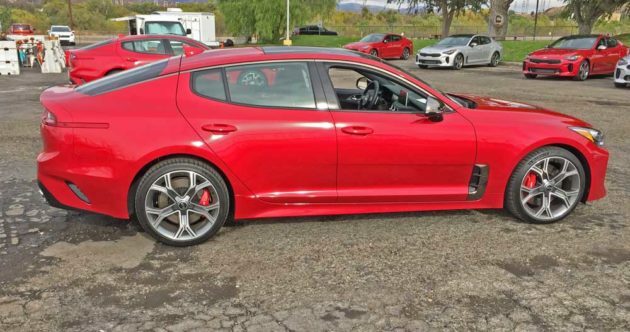 With only a mere six years in development from concept to production, Kia has produced a most impressive and highly capable fastback 4-door Grand Touring or Gran Turismo sedan. It?s the all-new 2018 Kia Stinger which is available in five levels of trim or models: There?s the base Stinger; Stinger Premium; Stinger GT; Stinger GT 1; and Kia Stinger GT 2. The base and Premium Stinger models will draw their motive force from a 2.0-liter, DOHC, 16-valve, D-CVVT GDI Twin-scroll turbo inline 4-cylinder engine with Gasoline Direct Injection that produces 255 horsepower at 6,200 rpm while generating 260 pound feet of torque in a range from 1,400-4,000 rpm. All Stinger GT models are powered by a 3.3-liter, DOHC, 24-valve, D-CVVT GDI Twin- turbo-charged V6 motor with Gasoline Direct Injection which is rated at 365 horsepower at 6,000 rpm. The 3.3-liter mill also develops 376 pound feet of torque from 1,300-4,500 rpm. Both longitudinally front mounted engines gear energy to either the rear wheels (RWD) or optionally to all four wheels through an electronically controlled AWD system for an extra $2,200. via an eight-speed automatic transmission with steering wheel mounted paddle shifters. Base pricing ranges from $31,900 for a 2.0-liter RWD model to $49,200 for the 3.3-liter RWD model. Add another $900 for Destination and Handling. The exterior styling of the all-new Kia Stinger reflects its European influence was overseen by Peter Schreyer, Kia Motors? chief design officer and his design team in Frankfurt, Germany in a fastback form (it is essentially a five door, five passenger GT with a long wheelbase, long hood, broad shoulders and short overhangs. The Stinger was developed on the legendary Nurburgring circuit. 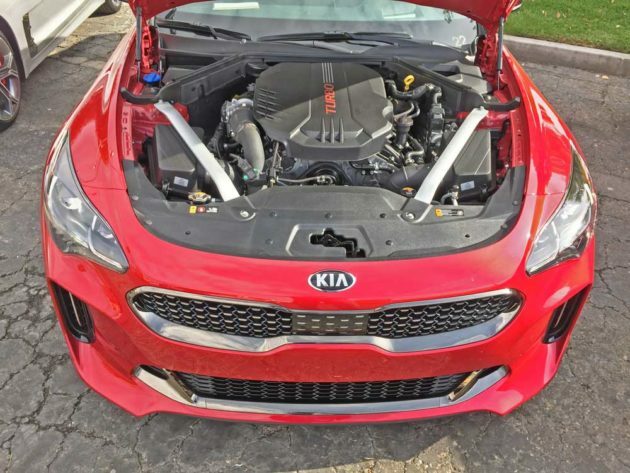 It leads off with Kia?s signature grille, positioned above a lower air intake and flanked by additional air ducts and wraparound headlamps. The profile is sleek and aerodynamic with a drag coefficient of 0.30. The rear finishes with an integrated decklid spoiler and twin dual exaust outlets. Moving into the cabin, all Stingers come standard with a leather-appointed interior, with ultra-soft Nappa leather optionally available. The multifunction steering wheel is a thick leather-wrapped affair with paddle shifters and the GT trim levels get a flat-bottom wheel. All Stingers offer an available, large color TFT instrument cluster with performance gauges including a track timer. 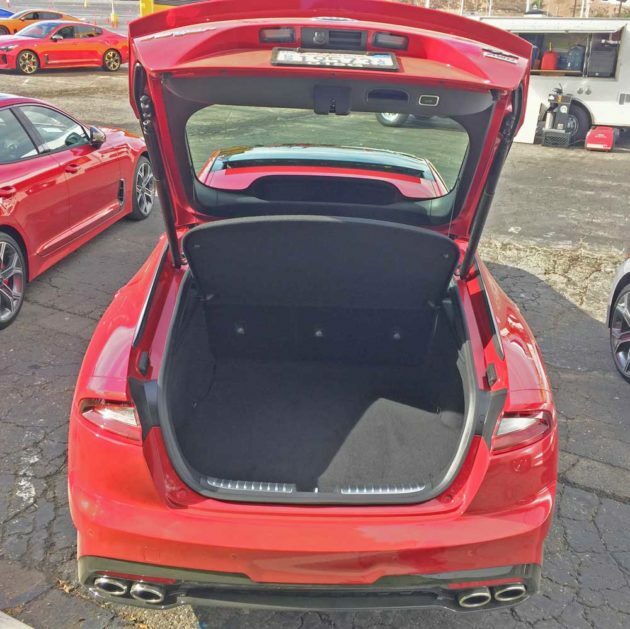 The Stinger provides a substantial 23.3 cu.-ft. of cargo space that may be accessed via a power rear liftgate with available Smart Trunk functionality as expected in a true gran turismo automobile. ?But it?s a Kia? might be the negative reaction of some naysayers – – ?How can it possibly compete in the high performance Grand Touring arena?? Well, if you’re one of those individuals, kick that line of doubtful thinking to the curb, because you’re all wrong!! 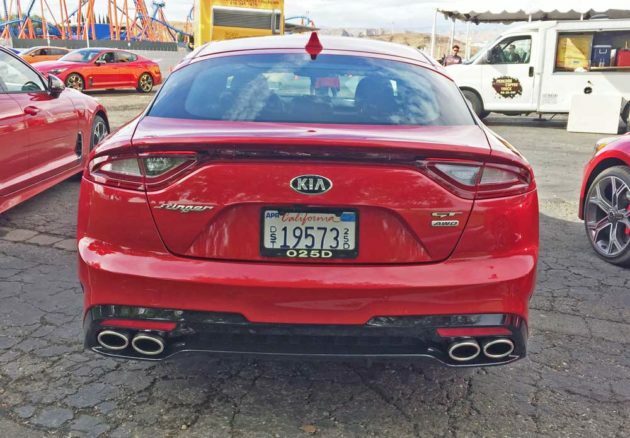 I?m here to tell you that the 2018 Kia Stinger is truly a genuine high performance four-door grand touring sedan that is not only capable of competing with, but of actually outperforming many Asian and European vehicles that fall into this category on many levels. How can this be you ask? I?ll tell you?? It isn?t often that an auto manufacturer goes to great lengths to substantiate or prove their claims referencing the mettle of their new wares, but the Kia team did just that and it?s really most refreshing to find that a vehicle lives up to what it?s claimed to be. We?re not talking hype here folks, but fact. The Kia team arranged for a drive route that included the twisting mountain roads of the Angeles National Forest, freeways in the L.A. Basin and inner city congestion as well. 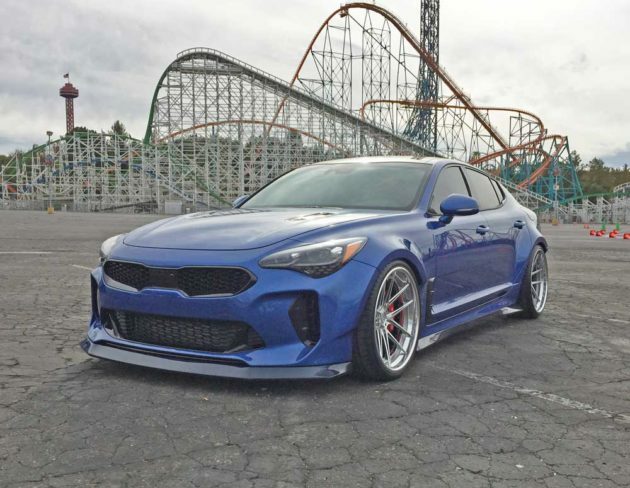 The mid point of the drive ended at the Six Flags Amusement Park which was closed where a challenging autocross course was set up to allow flogging the new Kia Stinger GT2 to one?s heart?s content. Not so unusual you say? Agreed that being able to test the Stinger over the course repeatedly was not really out of the ordinary. Putting it up against some of the performance craft of several competitive manufacturers over the same course was definitely out of the normal modus operandi. Included in the competitive set of vehicles were the following: a 2017 Infiniti Q50 3.0L V6; 2017 3.5L Lexus GS 350; a Porsche Panamera 3.0L 6-cylinder RWD; and 2018 models ? an Audi A7 Sportback AWD; a BMW 4-Seres Gran Coupe and BMW 6-Series Coupe; and a Mercedes-Benz CLS Class sedan ? 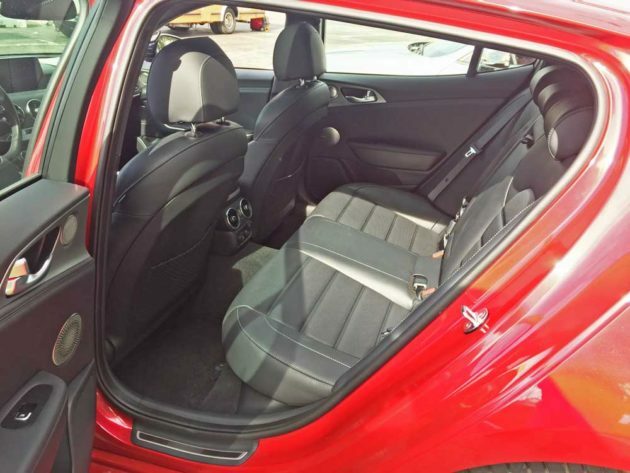 all of the 2018 vehicles were 3.0-liter 6 cylinder powered. My schedule only permitted driving the Stinger GT2 AWD, the Audi A7 Sportback, BMW 6-Series Gran Sport and the Porsche Panamera. The Audi A7?s performance was acceptable across the board as was that of the Porsche Panamera, but it felt somewhat numb. I?m a fan of BMWs, but the BMW 6-Series was the worst of the lot. I didn’t test the 4-Series Bimmer, but those who did felt that even it was better than the 6-Series. The Kia Stinger was clearly the most impressive. It served up the most athletic feel, the quickest acceleration, smooth and intuitive automatic shifting. It was both predictable and stable.Not once dod it plow even when pushed hard. The 6-Series BMW was the only competitor that I managed to wipe out course marking cones with ? and I wasn?t the only one. The Stinger was the least expensive and the Panamera the most expensive. The Stinger also delivered the most horsepower and torque, and was the quickest and fastest of the lot. I didn?t have the opportunity to drive the 2.0-liter four cylinder following the program. Author having fun on the Auto cross course. Incidentally, the Kia Stingers happened to be pre-production vehicles, while the competitive vehicles were all production units. My test Stinger was an AWD GT2 with a HiChrome Red metallic exterior and a Black interior. Other colors in the palette are: Snow White Pearl, Silky Silver metallic, Aurora Black Pearl, Ceramic Silver, Micro Blue Pearl, Panthera Metal metallic and Sunset Yellow. The GT2?s base price was $49,200. With the final sticker total climbing to $52,200 after adding AWD and the Destination and Handling. All other features (and there were a ton of them ? the complete list being too lengthy to include here) were standard fare. 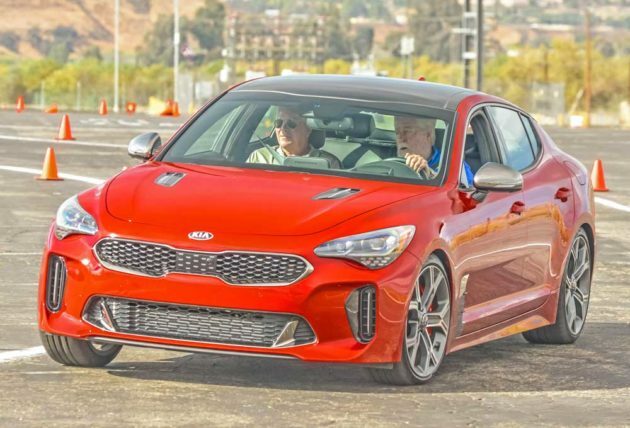 The base Stinger rides on a more passive suspension that?s tuned to deliver a balance of handling and ride comfort, while the GTs are available with Kia?s first electronically controlled Dynamic Stability Damping Control and standard high-performance Brembo? disc brakes. Rolling stock for my GT2 tester were staggered Michelin Pilot Sport tires – 25/40 R19x8 Front / P255/35 R19x8.5 rear Mounted on 5-s sculpted ?Y? spoke alloy wheels. AWD models come with Dynamic Torque Vectoring offering five distinct settings ? Smart, ECO, Comfort, Sport and Custom. There are Multiple Advance Driver Assistance systems that combine to provide an enhanced driving experience, including: Driver Attention Warning; Forward Collision Avoidance with pedestrian detection; Smart Cruise Control with Stop & Go; Lane Keeping Assist; Blind Spot Collision Warning; and Rear Cross-Traffic Collision Warning. A height-adjustable color Head-Up Display is also available with info on speed, turn-by-turn NAV, Blind Side Detection, audio and Cruise Control. The base audio system for the 2.0-liter turbo features six speakers and a seven-inch color touchscreen with the latest version of UVO, Kia?s telematics system. The standard audio system found in the GT models ups the speaker number to nine and includes an external amplifier. A premium Harman/Kardon? audio system that features Clari-Fi? and next-generation QuantumLogic? Surround Sound technology is also available. 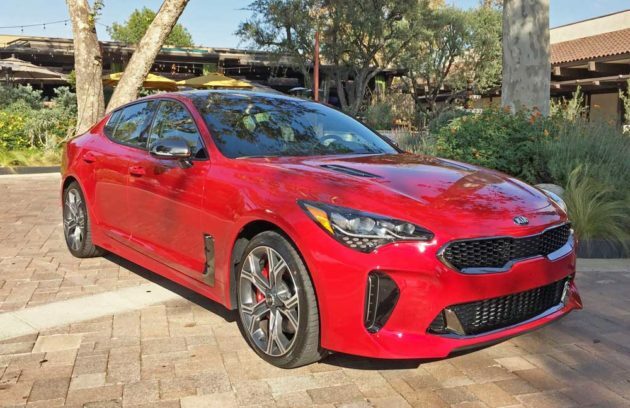 SUMMARY: Driving the new Kia Stinger GT2 AWD is a rewarding and joyous experience. It is soft, comfortable and vertically complaint over irregular surfaces, while exhibiting remarkable lateral stability. It literally combines the ride quality of a luxury sedan with the handling attributes of a high performance sport sedan when necessary. It remains flat and stable when driven hard into corners. Acceleration is instantaneous as long as the engine?s turbos are engaged and the revs are kept from dropping too low. On the low end of the broad torque range however, some minimal turbo lag may be experienced. The transmission shifts smoothly in its automatic mode, but isn?t tuned to respond quickly enough for really spirited scenarios, where use of the paddle shifters is recommended, delivering a more satisfying level of control. 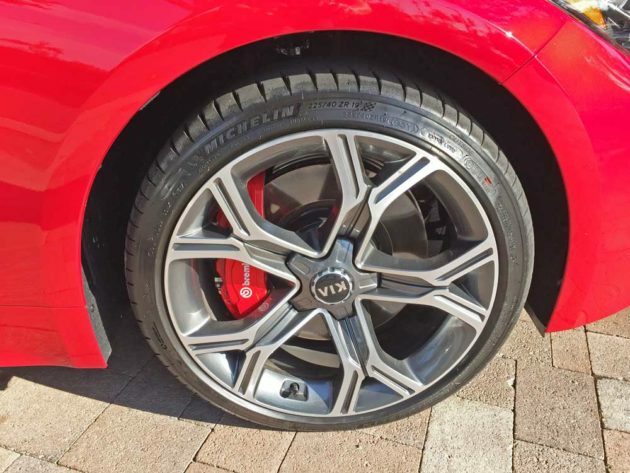 The Brembo brakes do an excellent job of bringing the Stinger to a halt from speed. Given the performance quotient, feature content and value pricing, the new Kia Stinger represents an outstanding initial undertaking of the production of a Grand Touring sedan by a Korean automaker. 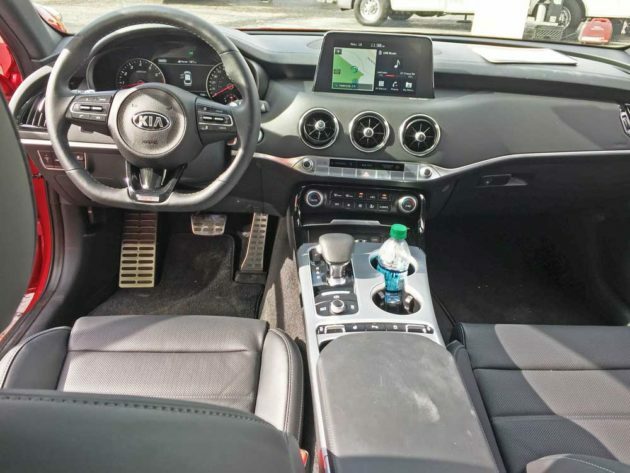 Bottom line Kia is definitely a serious player in this highly competitive market segment. It displays an emotional design quality, and its performance capability matches its good looks. Does it throw down the gauntlet, capable of challenging the European examples in this category? We think so, and it?s sure to grow ever better as time progresses. 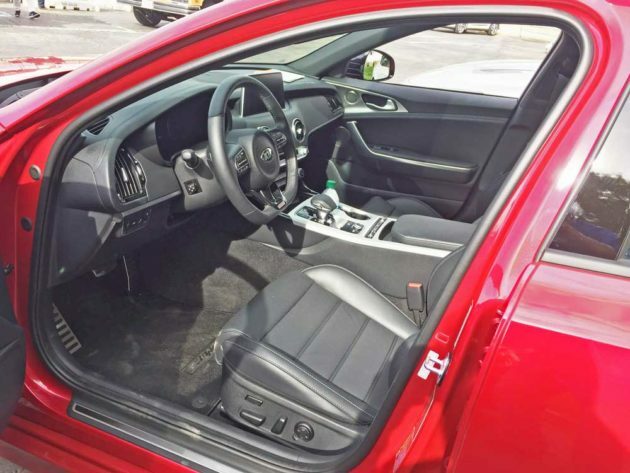 Transmission: Eight-speed automatic with steering wheel mounted paddle shifters. Suspension: Front – MacPherson strut with gas shock absorbers.Base & Prem / Gas or electric on GTs. Rear ? Multi Link (5) with gas shock absorbers. Base & Prem / Gas or electric on GTs. Tires: Staggered Michelin Pilot Sport 225/40 R19x8 Front / P255/35 R19x8.5 rear Mounted on 5 stylized “U”-spoke machine face alloy wheels with painted inners. 0 ? 60 mph: 4.7 seconds ? Top Track Speed=167 mph.